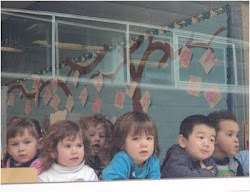 This year, the Akiba-Schechter Preschool and Kindergarten has truly gone international. While we've always had a diverse student body and faculty hailing from Europe, Asia and Israel, and of course all over the United States, and while our study tours of the early childhood educational center in Reggio Emilia in Italy are in their third year, we have now built a connection across the Pacific with early-childhood educators in China! During this year's study tour at Reggio Emilia in March, Preschool Director Carla Goldberg met with Yinna Zhang from the Erikson Institute, a graduate school for child development in Chicago. Ms. Zhang serves as the liaison between Erikson and teachers/directors in China and arranges study tours for early childhood educators and directors from China to spend three weeks in Chicago to visit a few schools. On these visits, Chinese educators do a "deep dive" at each school, spending several days to really get to know administrators, teachers and children. We are so happy that a group of early childhood educators from Beijing spent three days at Akiba this past week. They observed in classrooms, interacted with students, and answered the children's questions about school in China. They shared pictures with the children and taught them some songs in Chinese. On two days, everybody had lunch together; this was a great opportunity for us to share about Akiba-Schechter and for the visitors to share about their program. What a wonderful opportunity for Akiba-Schechter teachers to share their expertise and experience, and also to learn about school in China! Gift-giving is an important part of Chinese culture and so, in anticipation of the visit, each classroom created a gift for the teachers from China, such as a welcome sign, a book from the students with pictures and photos, and one class even baked cookies for the teachers and their students. Many of the gifts included writing in Chinese, which was done by Akiba-Schechter parents. One of Akiba's Chinese parents joined for part of the days to share her experience here. On Friday the visit ended with sharing Akiba's Shabbat celebration with the visiting teachers. It was a beautiful celebration, and they loved being a part of it. Hosting a delegation of Chinese early childhood educators was a tremendously meaningful experience for everyone, a true cultural exchange. Akiba-Schechter faculty was so proud to share how they teach, and specifically how they work on creating a community in their classroom and with their students' families. We plan to keep in touch with our new peers in China and send emails/videos from our students so that we can share the two worlds. We are happy to have extended our community to China and to have this opportunity to learn and share!